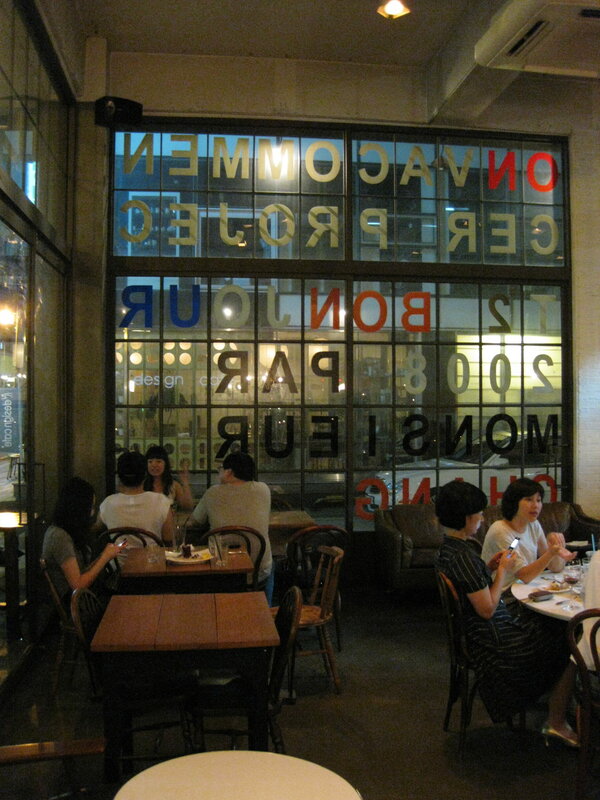 Apgujeong’s posh charms can only be half experienced in a lunch or dinner outing — to really get a sense of the extravagance that this neighborhood is capable of, you have to hit the nightlife spots. First, you’ll want to fuel up a bit before heading out. 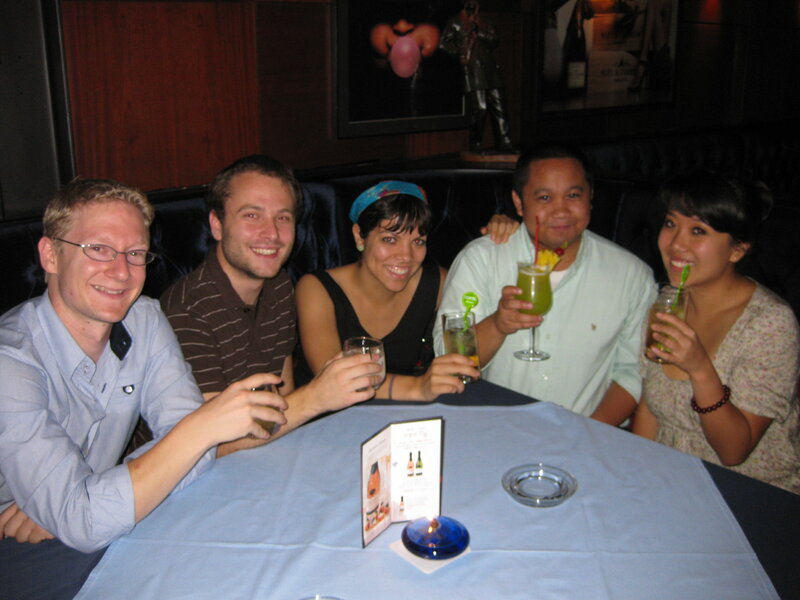 Fifty (50) is a great way to get your class on before hitting the fancier (or raunchier) joints in town. 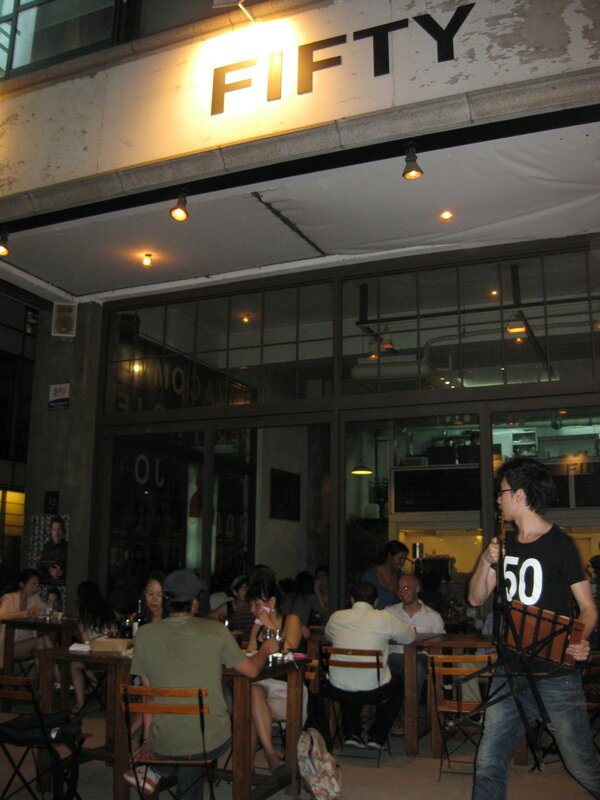 Situated nearby Kitchen Salvatore, this cafe’s capacious, open atmosphere, chandlier-lit interior decor with mirrors and tall windows covered with letters, pictures and graffiti give the cafe an art warehouse kind of feel and will put you in the mood for the hippest party Apgujeong has to throw at you. 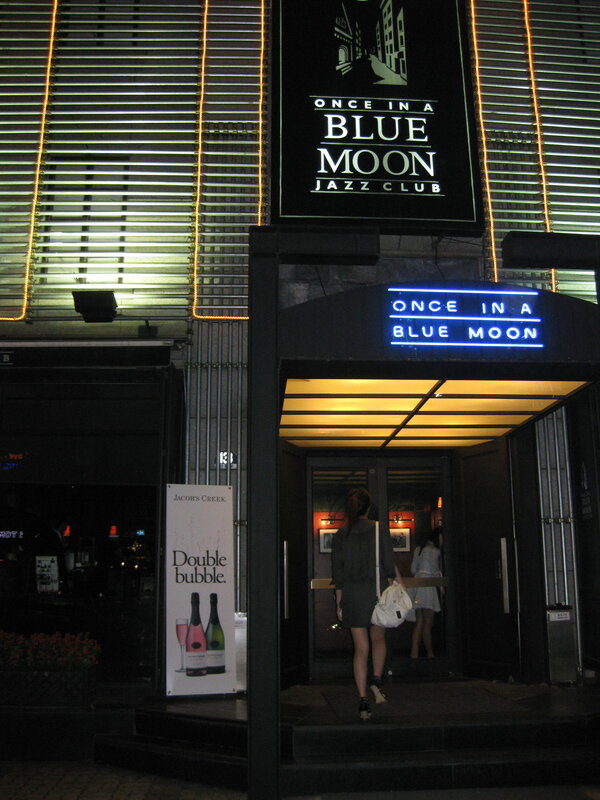 Following that, you have a choice between Apgujeong’s two flavors of nightlife — high class and no class. For all you party animals out there, let’s start with the latter. Monkey Beach is a haven of debauchery hidden along the staid streets of elite Apgujeong, and is worth a visit even if you don’t want to spend 20,000 won on dinner beforehand. The drinks are incredibly cheap for Apgujeong and come in that most Thai of formats: buckets, ranging from 2-6 shots at 5-8,000 won. Probably the closest thing to Thailand you will find in Apgujeong or anywhere else in town, especially once the fire dancers come out (10 PM on weeknights, various time on weekends) or when the various communal bar games begin, which everyone is encouraged to join in on. Scroll to the one-minute mark on this video to see what crazy possibilities can come of Thai drinking culture hitting Korea. For those who want to bridge the gap between high class and no class, Pierrot Strike strikes the perfect balance — and it does what Apgujeong does best, taking something not usually thought of as ‘classy’ and transforms it, as with the various Korean and Thai fusion restaurants and high-class pizza joints. 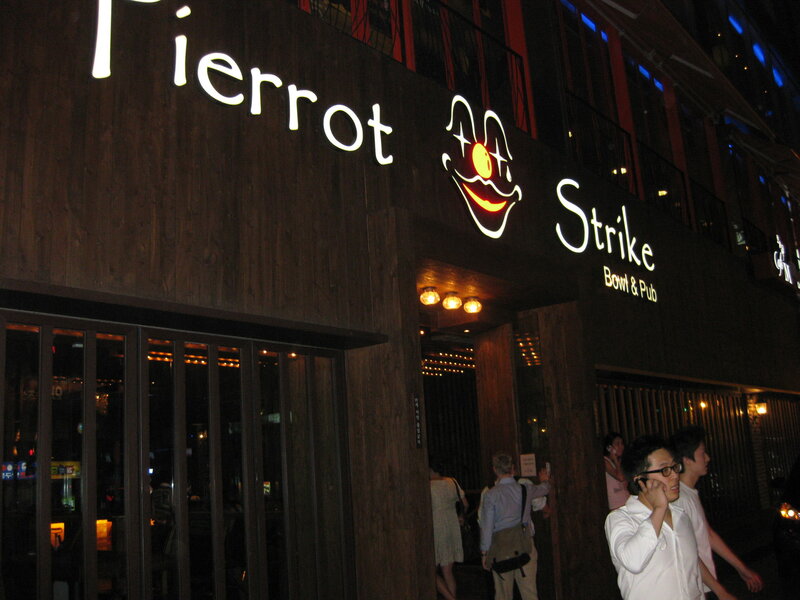 Pierrot Strike transforms those most beloved of bar sports: pool, darts, air hockey and above all, bowling. 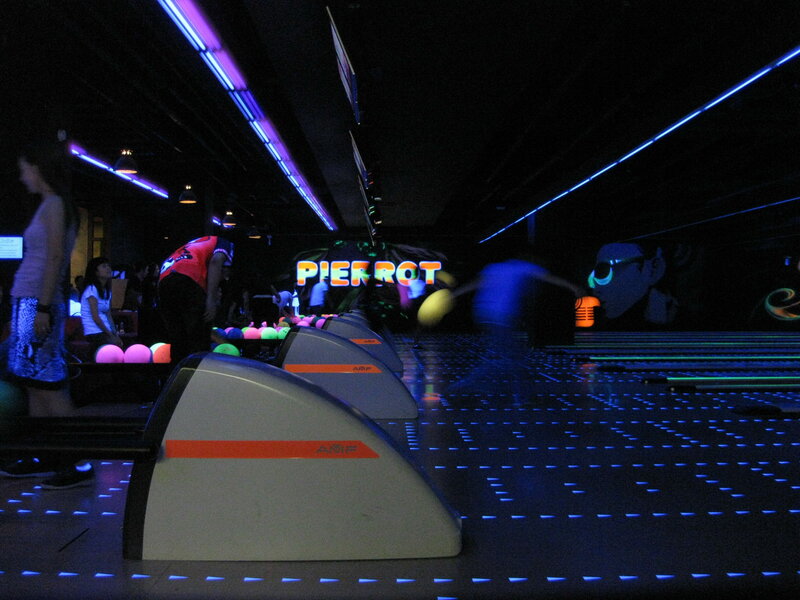 This isn’t your average bowling alley Thursday night laser show on offer here — this place is straight out of a Williamsburg, New York, hipster haven and has all the cool, sinister neon and creepy pictures of clowns to prove it. 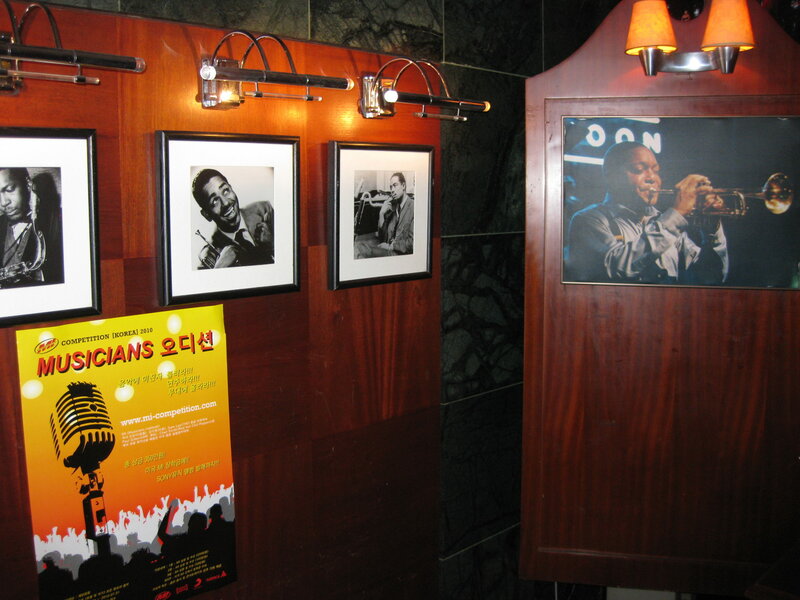 If you decide to take the full blown classy route, then the area’s excellent jazz bars are the way to go. 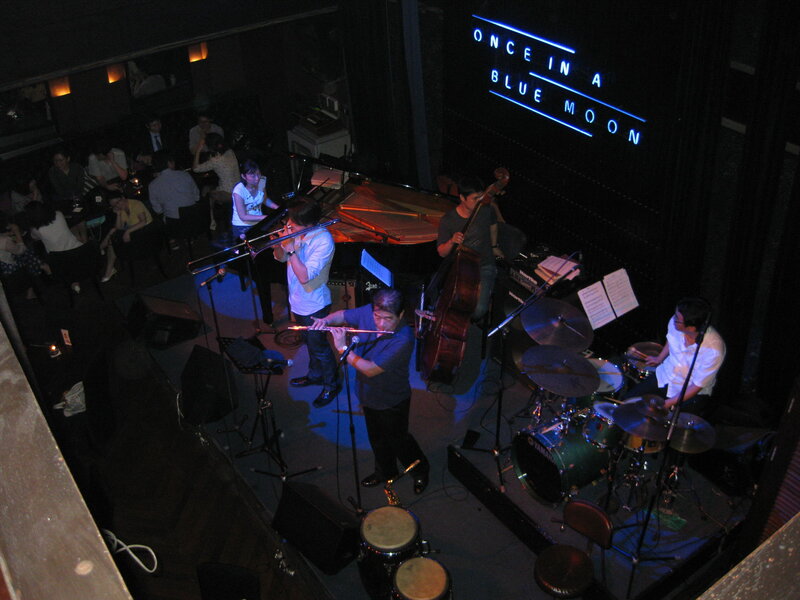 Once in a Blue Moon is the best among them (website), with excellent music, polite service, and sensual, intimate and… well… blue interior. The jazz was some of the best I have heard in town — a combo with sax, drum and piano with some voices playing mostly standard and familiar jazz riffs and melodies but then elaborating on them wonderfully, with exceptional improvisitory solos from every member extending each song to 10+ minutes, the way good live jazz ought to be. The musical skill was matched by exceptional acoustics — the music can be heard cleanly and fully in every corner of the bar, including the second level balcony, with the only deficit to some balcony viewers being the inability to see the stage except by means of TV monitors (while other balcony sitters, of course, have some of the best views in the house). 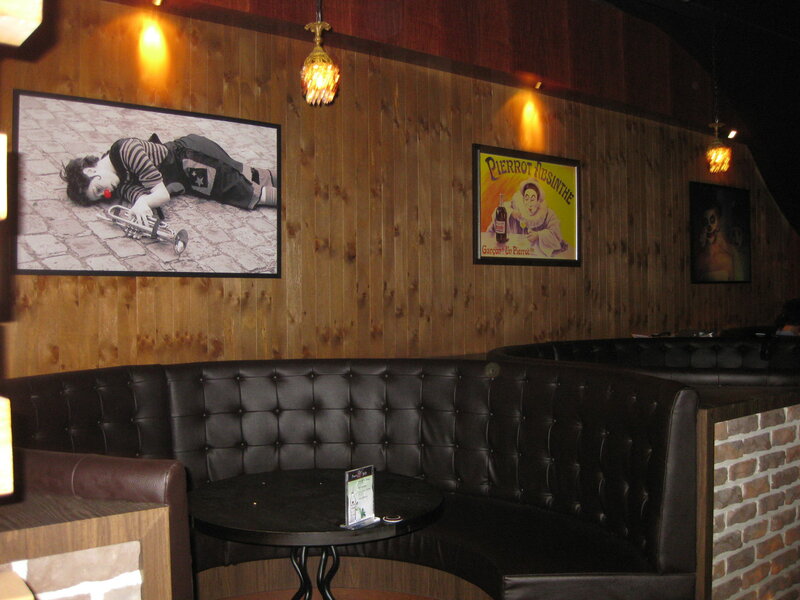 The tables and interiors are great for conversation regardless of what view you have of the stage and whether you are there for romance or just a nice night out with friends. And, believe it or not, the place has no cover charge! But don’t get your hopes up — you have to buy a drink, and drinks are minimum 12,000 for a cheap beer, going up to 18,000 and higher for better drinks. It gave me an excuse to buy a Glenmorangie single malt scotch aged 15 years though, which at 18,000 seemed a bargain — at least when Asahi and Hoegaarten cost 12,000. 1.) Go to Apgujeong Station on line 3, exit 2. 4.) Walk for 2-3 blocks before hitting a major intersection. Cross the road. 5.) Walk several blocks, about 10 minutes, until you see the Galleria Dept. Store. 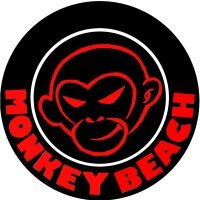 For Monkey Beach, continue walking and turn right after McDonald’s, then turn left at the second side-street and walk down until you see the red monkey face logo featured above, nearby Rodeo Drive. For Once in a Blue Moon, turn right down the major intersection on the opposite corner of Galleria — it will be on the left side of the street after about a five minute walk. 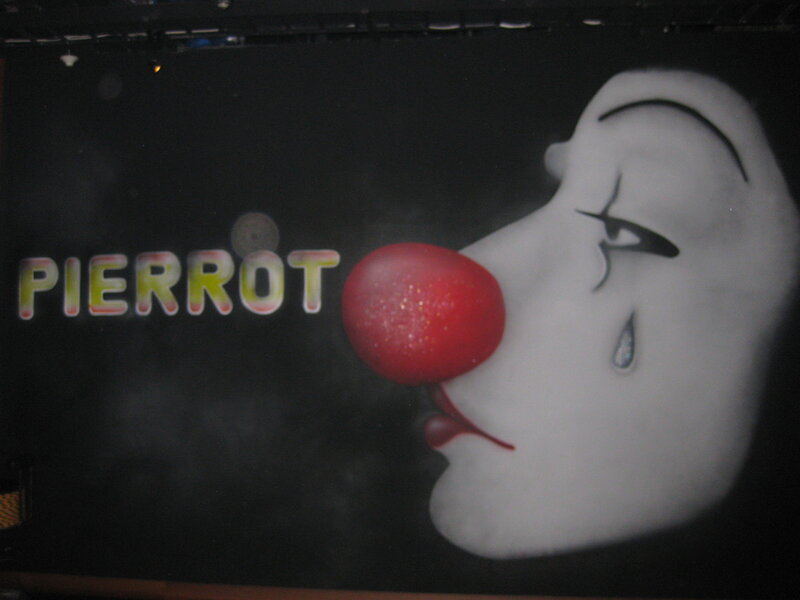 Pierrot Strike is two buildings down from Once in a Blue Moon. 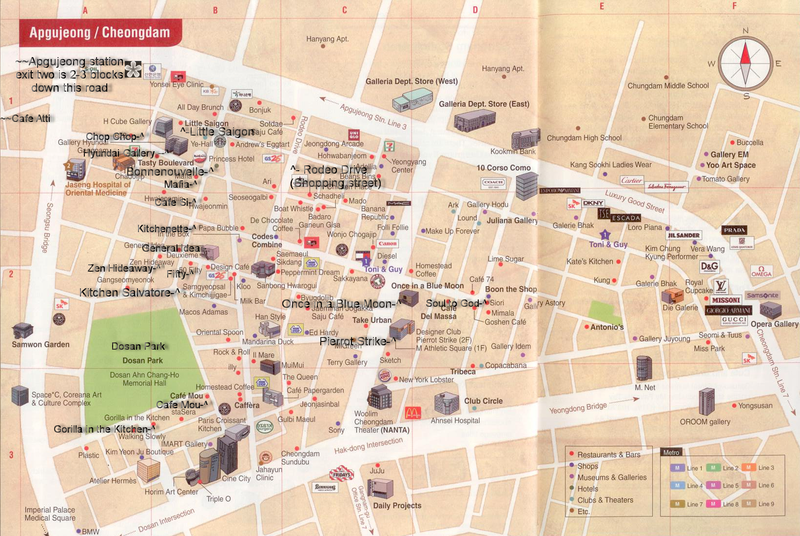 The highlights of this review and subsequent reviews have been marked on the map so you can more conveniently find them (click through to see a bigger and clearer version). Up next, Garosu-gil, the Paris of Seoul! take subway line 3 to Apgujeong, take exit 2 and walk straight toward Galleria for about 10 minutes. When you reach Galleria, cross the road and turn right just after McDonald’s. Then turn left at the second side-street, walk past a couple of buildings and you’ll see a red logo with a monkey’s face.